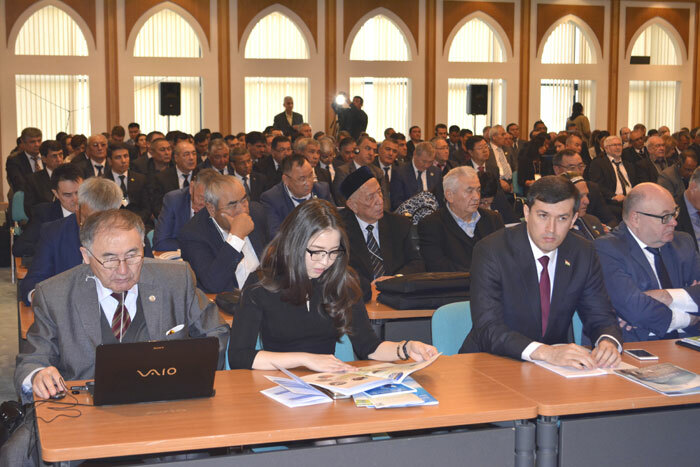 The key reports summarizing ICWC activity over 25 years were presented by the Chairman of the Executive Committee of the International Fund for saving the Aral Sea Mr. Bayjanov Guyzgeldy, as well as by the heads of country delegations from the Central Asian countries. Mr. Bayjanov congratulated all the participants with this anniversary of the ICWC, which always played a special role in the IFAS’ structure. 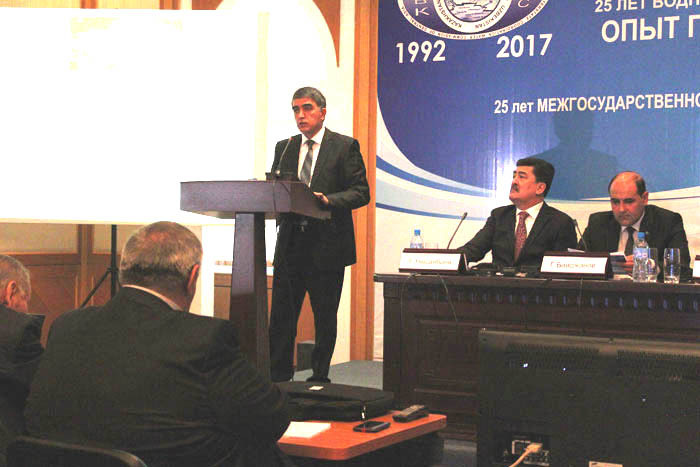 He voiced the main directions of Turkmenistan’s activity as the chairman of IFAS. He also informed about a summit of the heads of state to be organized in the year 2018, which would be the IFAS jubilee, in Turkmenistan chairing currently the IFAS. Vice-Minister of Agriculture of the Republic of Kazakhstan Mr. Ye. 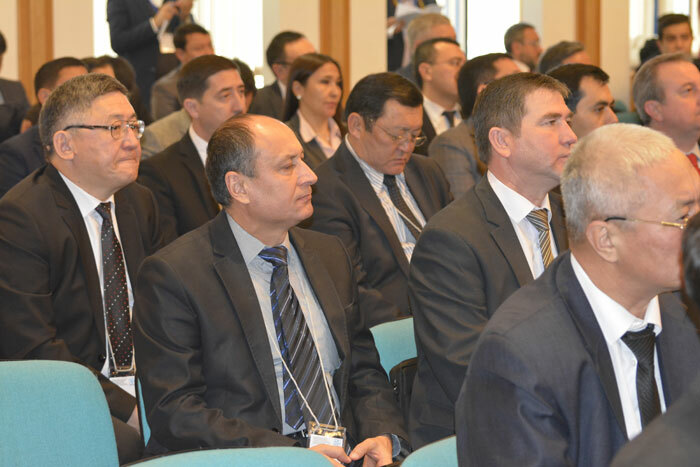 Nysanbayev assured that Kazakhstan has been always acting responsibly on decisions of ICWC – a unique organization with executive bodies and important tasks fulfilled on water management. Against the background of economic, geopolitical, and climate challenges, joint efforts by the countries are needed for the improvement of the legal framework. The institutional framework needs to be strengthened also as one shortcoming of the ICWC is the lack of efficient interaction with energy and environmental sectors. 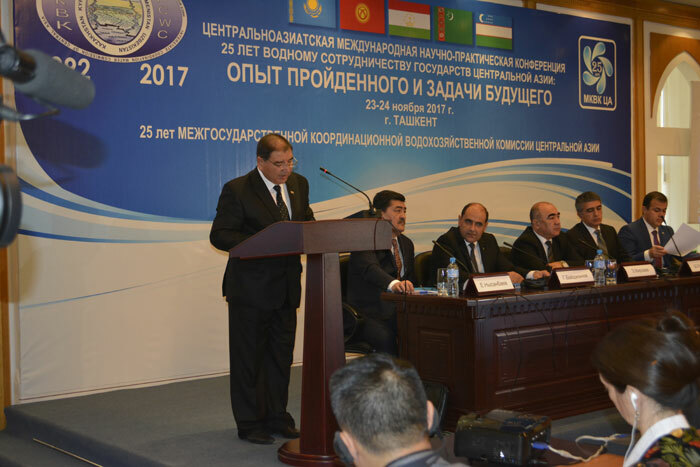 First Deputy Minister of Energy and Water Resources of the Republic of Tajikistan Mr. S.Rahimzoda noted that the region’s countries have suffered from the policies of self-sufficiency and self-sustainability; thus, the past experience was to be analyzed to strengthen friendship between the countries. He underlined that it was not possible to address water issues unless issues in other mutual spheres were addressed as well. “We are to use the historic chance offered to us currently in form of political will and new dynamics between the countries. 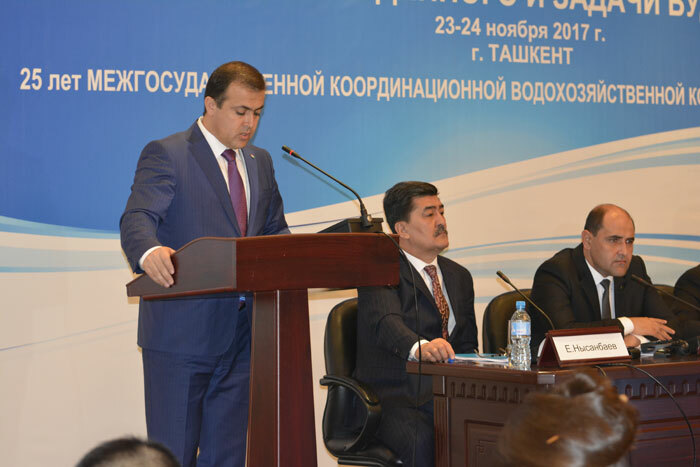 Tajikistan is ready to dialogue based on respect of the interests of all countries.” The reporter also thanked Uzbek friends for hospitality and invited the participants to visit Dushanbe on 20-21 June 2018 for launch of the International Decade for Action “Water for Sustainable Development”, 2018-2028. Head of Water Use Department at the Ministry of Agriculture and Water Resources of Turkmenistan Mr. B.Mommadov stated that the heads of state and directors of national water agencies in the region demonstrated their wisdom by establishing in 1992 the ICWC that contributed to conflict-free solution of issues related to water management. 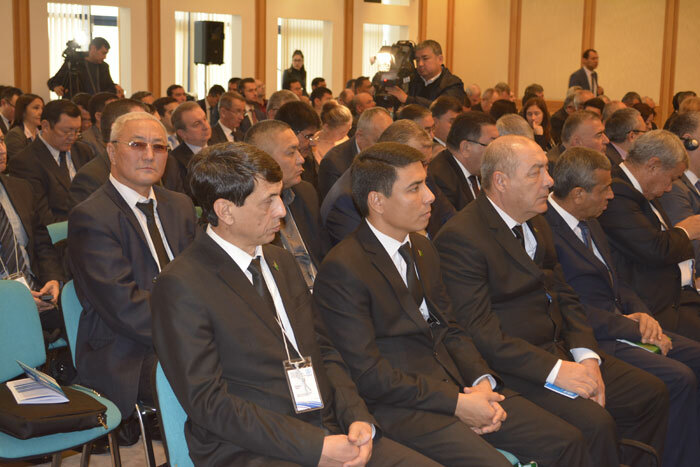 It was noted that the President of Turkmenistan called to develop water diplomacy as a new political-diplomatic form of relations in order to maintain regular dialogue to address all issues related to formation and restoration of water sources, their efficient use and saving. The reporter also informed about new initiative - “Amudarya Day” – which would be held on 28-29 November 2017. UNDP Resident Representative for the Republic of Uzbekistan Ms. H.Fraser congratulated the participants on behalf of the United Nations and underlined a great privilege to take part in such a presentable forum. 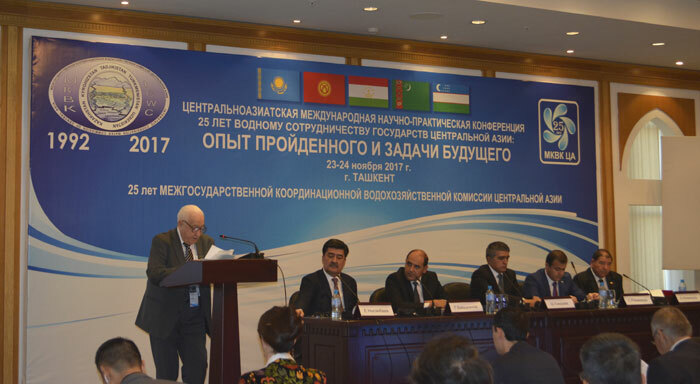 “Having such a functioning regional platform for coordinated management of transboundary water resources is a good sign of solidarity and cooperation among the Central Asian states.” The reporter stressed that in the conditions of climate change all needed to once again remind themselves of the need to take urgent actions to ensure the efficient use of such scarce resource. She continued that this could be achieved both by enhancing coordinated management of transboundary resources but also by minimizing water losses and introducing water efficient technologies in agriculture and other sectors of economy. Ms. Fraser finalized that the UN was therefore further committed to supporting the efforts on enhancing water use efficiency in the country and the region. “We’re convinced that formalized high-level dialogue combined with concrete collaborative steps such as sharing data and infrastructure or developing new financing tools for transboundary water management can be a powerful engine of change and contribute to strengthen cooperation for sustainable development and mutual prosperity in Central Asia.” Finally, the Ambassador wished a fruitful discussion and expressed his hope for continuation of mutual cooperation. The Head of EU Delegation to Uzbekistan Mr. E. Stiprais presented the EU-Central Asia cooperation programme and informed on allocation of funds for regional development over 2014-2020. The priority areas mentioned by him included the water sector, agricultural diversification, agricultural infrastructure modernization and reconstruction, and municipal water supply. GIZ “Transboundary Water Management in Central Asia” Programme Director Mrs. C.Milow told about the importance they attached to the ICWC and its activity. 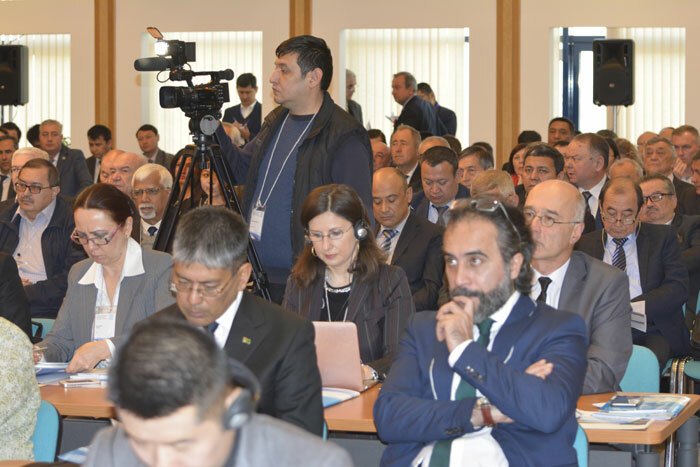 Since 2009, GIZ has implemented more than 30 projects in Central Asia, including assistance to the countries in elaboration of mutually acceptable mechanisms for water use and improvement of legal and institutional frameworks of cooperation. Currently the work on strengthening of BWO Amudarya and BWO Syrdarya is underway. Senior Regional Cooperation Specialist of ADB Mr. Guoliang Wu covered the key aspects of cooperation under the Central Asian Regional Economic Cooperation Program (CAREC). 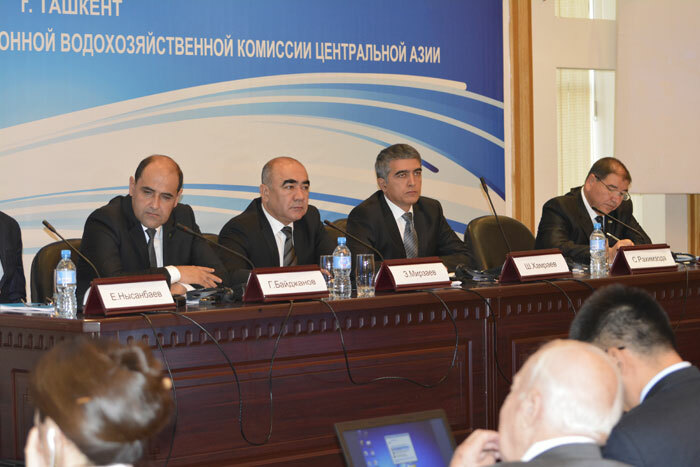 The reporter pointed to readiness of ADB to work with the Central Asian countries on water cooperation. 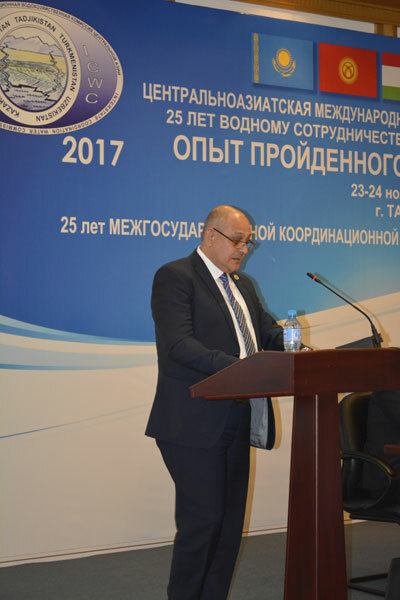 Acting Project Coordinator of OSCE in Uzbekistan Mr. J. Becker highlighted the key lines of cooperation with the countries in the area of environmental conservation and security. Heads of executive bodies of the ICWC also took the floor during the plenary session. Director of the SIC ICWC Prof. V.Dukhovniy told the participants about landmarks and outstanding people who established the ICWC. He underlined major achievements over the 25-year cooperation and called for searching the ways for rapprochement and consensus-building in the sphere of water, given that less water would be available per capita by 2050 in the region due to climate change, population growth and increased development in Afghanistan. For survival with 1200-1400 m3/capita/year against 2200 m3/capita/year, ones needs to work intensively to improve water accounting, make information open, introduce water-saving technologies, enhance institutional framework, and elaborate a financial-economic mechanism for better water governance. 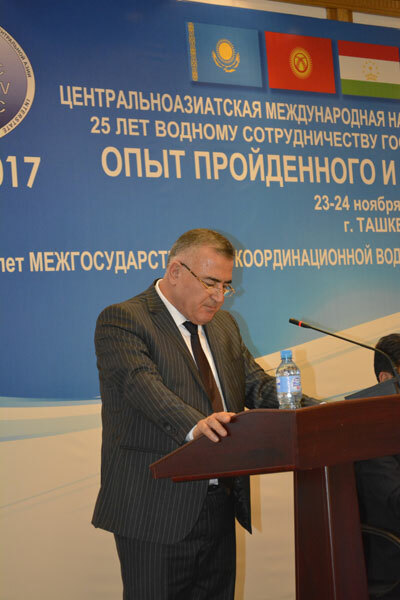 Head of BWO Syrdarya O.Kholkhujaev noticed that gathered experience enabled BWO Syrdarya to manage the tasks of water management and use in the basin to the benefit of all states in Central Asia, with account of environmental demand by the Aral Sea and by following the principles of international water law. Then the reporter underlined that thanks to the members of ICWC, serious problems, especially in complex hydrological conditions, had been managed. Thus, for protection of lower reaches from water logging, joint measures are undertaken to lower water level in the Syrdarya river channel by delivering water to canals. In dry years, actions are taken to mitigate water scarcity by making necessary adjustments to volumes of water supply to user-states and to schedules of water accumulation in reservoir cascades to catch inflow and receive electricity from upstream countries. BWO has been always trying to maintain governance at appropriate level and timely and efficiently solve the tasks assigned, thus contributing to achievement of comprehensive and mutually beneficial use of transboundary water to the benefits of all countries in the region. 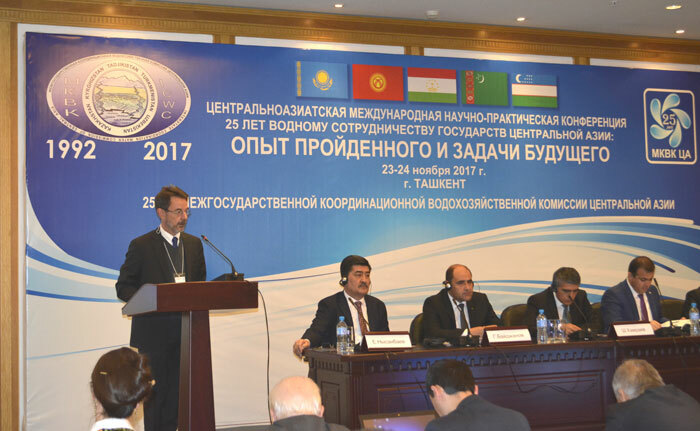 Executive Director of the Regional Environmental Centre for Central Asia Mr. I.Abdullaev told about activity of the Center for promotion of water cooperation. He particularly focused on small transboundary rivers, water quality, scientific cooperation and on organization of international environmental forum. During the plenary session, Vice-Minister of Agriculture of the Republic of Kazakhstan Mr. Ye. 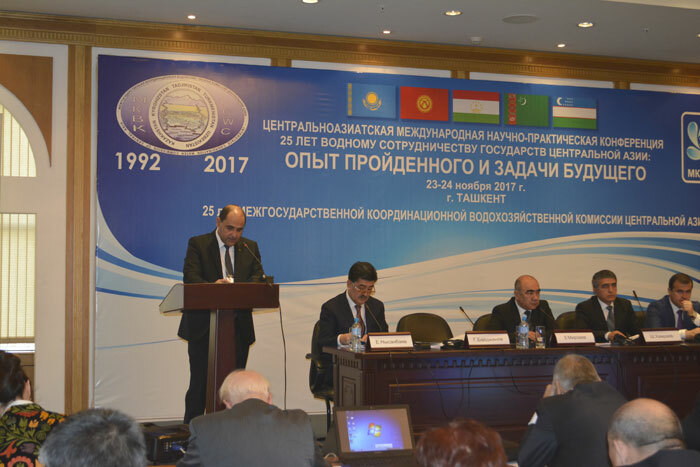 Nysanbayev also made the presentation “A Matter of Survival - Report of the Global High-Level Panel on Water and Peace”. The Global Panel was launched in 2015 upon Swiss initiative and under support of 14 other countries, including Kazakhstan. Members of the Panel were to examine the relationship between water and peace and prepare recommendations to push forward water as an instrument of peace. Based upon the results of two-year work, the report “A Matter of Survival” was issued in September 2017. A Symphony for Water and Peace composed progressively during two years as the Panel convened in different countries was performed on Uzbek folk instruments at the Gala anniversary dinner. Head of division of SIC ICWC Mr. A.Sorokin presented the participants the results of a comprehensive study of transboundary water management in the Amudarya River Basin for the long-term in the context of changes of climate and other factors and with account of national plans for irrigated agriculture and hydropower development. That study was made possible in the Project “Transboundary water management adaptation in the Amudarya basin to climate change uncertainties” implemented within the framework of the PEER Program with the support of the U.S. Agency for International Development (USAID). Mr. H.Manthrithilake (IWMI) and Mrs. S.Shivareva (Regional Hydrology Center) also took the floor and welcomed the participants.